Southern California is ground zero for upwardly mobile middle-class Latinas. Matriarchs like Mercy Amado--despite her drunken, philandering (now ex-) husband--could raise three daughters and become a teacher. Now she watches helplessly as her daughters drift apart as adults. The Latino bonds of familia don't seem to hold. Celeste, the oldest daughter who won't speak to the youngest, is fiercely intelligent and proud. She has fled the uncertainty of her growing up in Los Angeles, California, to seek financial independence in San Jose. Her sisters did the same thing but very differently. Sylvia married a rich but abusive Anglo, and, to hide away, she immersed herself in the suburbia of her two young daughters. And Nataly, the baby, went very hip into the free-spirited Latino art world, working on her textile creations during the day and waiting on tables in an upscale restaurant by night. Everything they know comes crashing down in a random tragic moment and Mercy must somehow make what was broken whole again. Desiree Zamorano says that she was taken aback by the negative reaction to Sonia Sotomayor's "wise Latina" remark. And she is appalled by stereotypical rendering of Latinas in mainstream literature, saying that true-to-life middle-class Latinas are invisible in the fabric of American culture. Zamorano is a playwright, Pushcart Prize nominee for fiction, and the director of the Community Literacy Center at Occidental College. She also collaborates with InsideOut Writers, a program that works with formerly incarcerated youth. She lives in Pasadena, California. Desiree Zamorano is a playwright, Pushcart Prize nominee, and novelist. She is the director of the the Community Literacy Center at Occidental College; she also collaborates with InsideOut Writers, a program that works with formerly incarcerated youth. She lives in Pasadena, California. 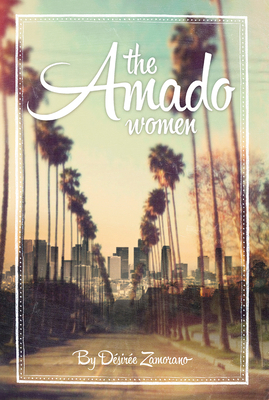 The Amado Women is her first trade-published novel.